The Royal Institute of Chartered Surveyors (RICS) recently released the results of their 2017 Q3 Commercial Property Market Survey at a breakfast event held at UBS’ new offices in London. For those involved in the property sector, there are unlikely to be any major surprises, but there were a number of interesting titbits which can be gleaned from the data. Tarrant Parsons, an economist from the RICS, presented the findings, highlighting some of the key trends. 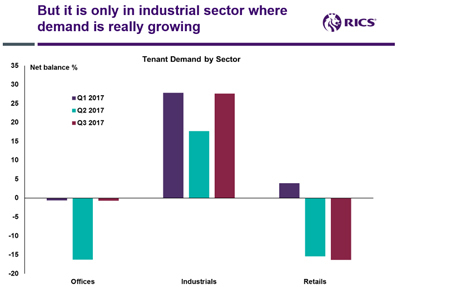 From an occupier point of view, tenant demand fell in the retail sector, continuing the trend of the decline in high street and the rise in online shopping. Office demand was stable, although tenants are now expecting more and more incentives to entice them into a new space. However, the standout performer was the industrial sector. With the rise in ‘last mile’ delivery and increasing demand from online shopping, the industrial sector has been on the move for some time, with tenant demand rising strongly with a net balance of 28%. The strength of the performance here is underlined by a continued decline in incentives offered within the industrial sector. Looking at investment, the picture is slightly rosier, with an increase in enquiries, including from overseas buyers, despite expectations of market uncertainty due to Brexit. The industrial sector again outperformed the market, showing the strongest increase in investment enquiries. 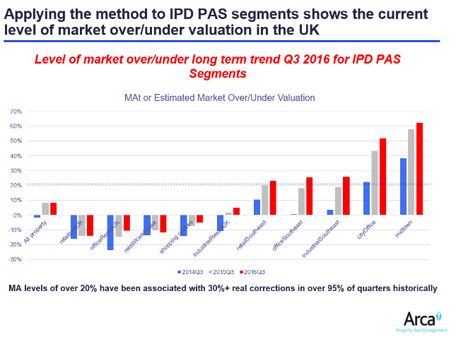 Capital values echo the wider picture, but also display the difference between the primary and the secondary market, with secondary retail showing negative capital value expectations. 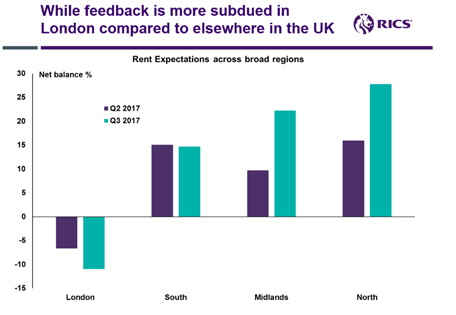 Geographically, the national view is positive all round; with good rent expectations and the majority seeing the market as fairly valued, with the only exception being London, which is taking a more cautious view. Although expectations in the capital remain flat, this is buoyed up by the industrial sector, with views for secondary retail and offices looking remarkably sanguine. 67% of respondents to the survey viewed Central London as being overpriced, and 73% felt that the market was in a downturn. Turning to the regional view, matters are much more positive, with the most prevalent view being that we are in the mid stage of an upturn in the market, and projections all round show an optimism. Another focus of the event was risk management methodologies, which may well be included in future RICS Market Surveys. 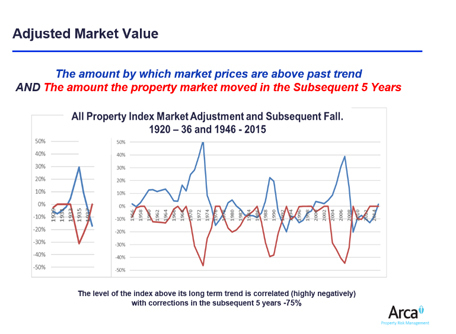 The methodology highlighted by Charles Ostroumoff of Arca Property Risk Management, was the Adjusted Market Value (AMV) method. 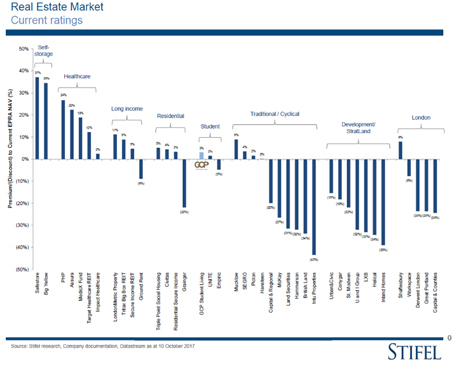 Which compares current rates against the long term value, and identifies points where the market is overvalued and ready for a correction. Looking at current market trends, the sector which stands out as overvalued is city offices, which the panellists agreed was at the peak of the market. However, caution was urged when using this methodology, as it needs to be used in tandem with consideration of other factors, for example increased infrastructure in mid-town (between West End and the City) is leading to prices looking inflated but actually demonstrating long-term growth. The final highlight was a panel discussion featuring Charles Ostroumoff, Jeremy Marsh of Schroders, William Hill of the Worshipful Company of Chartered Surveyors, Zachary Gauge of UBS Asset Management and Adam Alari of AXA Investment Management. As well as discussing the AMV risk methodology, they also highlighted the emergence of the alternative asset class, along with the traditional retail, industrial and offices model. This includes things like healthcare, self-storage, student accommodation and B2R assets. When compared to traditional investment funds, those specialising in these alternative asset classes are significantly outperforming, albeit generally at a lower level of overall capital employed. Although there is still caution surrounding some of these as an unknown quantity, investors are currently actively investigating these opportunities and it is expected that 15% of their investment will be in these alternative assets in the next 10 years. The message of the morning, then, was one of overall optimism. 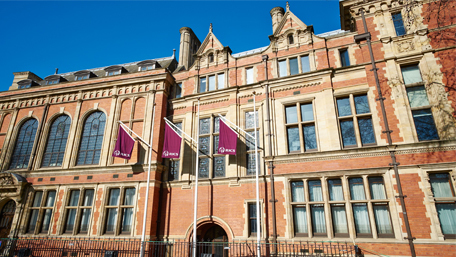 While London seems slightly dour, there are very clearly opportunities if you look beyond traditional markets to the outer regions and alternative assets. For the savvy and adventurous investor, there remains plenty of scope for market activity and money to be made!